I was really busy the week this theme came up but I really wanted to make sure I did one. Coincidentally, I had a Calvin & Hobbes commission that needed to be done, so here's me killing two birds with one stone. These characters mean an awful lot to me. Like Nathan (and I'm sure a lot of people at the time) I spent my childhood filling notebooks with drawings of Calvin and Hobbes, and they're a huge part of the reason I'm drawing at all today. My Grandpa would give me the collections to read and when the strip ended in 1995 I was heartbroken. 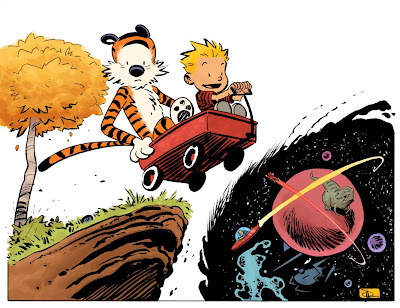 So thanks, Mr. Watterson, for teaching me how to draw trees, dinosaurs, explosions, monsters, space, snowmen, and kids and tigers. Awesome! So great that you found the time for this! Wonderful illustration and commentary. Thank you for making and taking the time. Wonderful indeed.